The new consensus: a “Novorossiya” as a Russian protectorate? Dnipropetrovsk Regional State Administration Head Ihor Kolomoisky is sure that the appointment of Viktor Medvedchuk as governor of Donetsk Oblast is the last chance to avoid a full-scale war in Donbas, as reported by Oleksandr Tkachenko, CEO of the 1+1 media holding. Ligabusinessinform reports that Ihor Kolomoisky is the owner of this holding. War will be the only alternative to this deal, concludes Tkachenko on his Facebook page. “Not only do I support Medvedchuk’s appointment as governor of Donetsk and Luhansk Oblasts, now I aggressively advocate for it. And if the separatist leaders will not approve his candidacy, this will mean that they ignore Vladimir Putin, the godfather of Medvedchuk’s child,” Kolomoisky said in a telephone conversation with Tkachenko. Borys Filatov, Kolomoisky’s deputy in the Dnipropetrovsk Oblast State Administration, confirmed on his Facebook page that the conversation between his boss and Tkachenko indeed took place. “Yes, this conversation really happened. I do not comment my boss’s considerations. I do not like to speak for others. It is against my rules to do so,” wrote Filatov. Earlier, media reported that Viktor Medvedchuk and Nestor Shufrych may soon lead Donetsk and Luhansk Oblasts as a compromise between the Ukrainian government leaders, the terrorists in Donbas, the Russian leadership, and the leaders of the West. Viktor Medvedchuk and Nestor Shufrych are close friends and have been connected to each other since at least 1998, the era of the United Social-Democratic Party. These developments are quite realistic. The issue is that Kyiv, weakened by contradictions, does not fully control Ukraine’s Southern and Eastern regions. Note that all these regions (Dnipropetrovsk, Kharkiv, Sumy, Donetsk, etc.) each have their own versions of local armies which support Ukraine; e.g., the Donbas Battalion, Dnipro Battalion, and so on. 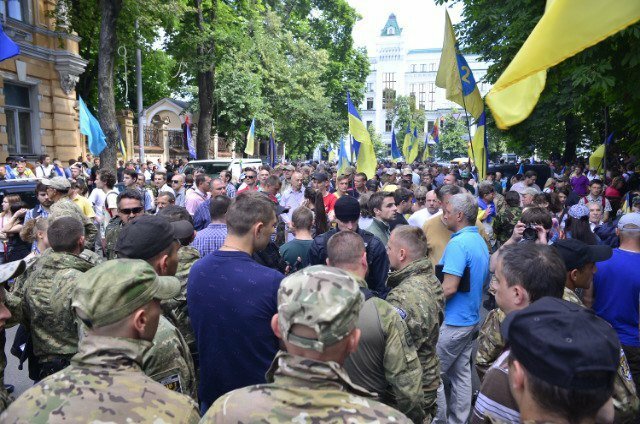 These military formations arose due to Kyiv’s inability to protect the citizens of these regions from the Russian invasion or from Russian-backed terrorists. In his article “Poroshenko’s Zugzwang: The short sad history of a promising president,” Yuriy Romanenko called the execution of a similar scenario “Bosnia 2.0,” drawing an analogy with the state model which has been established in Bosnia and Herzegovina since the war of 1992-1995. It is characterized by the weakness of the state, which has insufficient resources to solve the contradictions between the various regions of the country. As discussed earlier, Russia counts on being armed with qualitatively new missile systems by 2018-2020, with a crucial part of their production relying on Ukrainian institutions and enterprises. The dependence of Russia’s defense industry on Ukraine cannot be overcome in so short a time. Getting Eastern and Southern Ukraine under its control could resolve this issue for Russia. Is Ihor Kolomoisky’s approach directed toward balance between US, EU, Russian, and Ukrainian interests in his understanding? Or maybe he has just been informed about the hidden consensus between the US, the EU, Russia, and Ukraine on the regional status of Ukraine’s terrorist-besieged regions. Such a consensus can be inferred from this article by political analyst Pavlo Nuss, in which he alleges that Poroshenko is being compelled to resolve the situation in the east through exclusively peaceful means. “We forget that a European ultimatum has actually been issued to the president of Ukraine, requiring him to resolve the situation in the east only through peaceful means, using diplomacy to reach a political decision. Only then will the key EU countries be ready to ratify the Comprehensive Agreement on Association and Free Trade Zone between the EU and Ukraine, which was signed on June 27,” he said. Unofficially, the US position was discussed during Zbigniew Brzezinski’s presentation “Confronting Russian Chauvinism:” “Ukraine will not be a member of NATO. But by the same token, Russia has to understand that Ukraine will not be a member of some mythical Eurasian Union that President Putin is trying to promote on the basis of this new doctrine of a special position for Russia in the world. Ukraine will not be a member of the Eurasian Union, but Ukraine can have a separate trade agreement with Russia, particularly taking into account the fact that certain forms of exchange and trade are mutually beneficial. Agricultural products, for example, from Ukraine to Russia. Industrial products that Russia needs and are being produced in Ukraine. Not many people realize that some of Russia’s best rockets, most of the engines for Russian civil aviation, and some of the rockets used by the United States are produced in Ukraine. It’s a profitable and successful industrial enterprise. And that, therefore, should be continued under an arrangement whereby Ukraine and Russia have a special treaty,” Brzezinski added. This scenario was first mentioned in the article “The first target of Putin’s Russia is not only Crimea, but all Eastern and Southern Ukraine” on March 16, 2014. A strong resistance by the Ukrainian army, unexpected by Russia, a failure to fully destabilize Eastern and Southern Ukraine, and unexpectedly strong pressure from the West would force Russia to consider a backup scenario. This scenario, if military intervention fails, could be to put Crimea and possibly all of Eastern and Southern Ukraine under the “protectorate” of Russia, while formally leaving them a territory of Ukraine. Rallies against the truce declared by the President of Ukraine were held today in Kyiv. Participants of the meeting read out their demands and gave them to the President through Gennady Zubco, first deputy head of the Presidential Administration. “On behalf of the people of Ukraine…we appeal to you with the following requirements: stop the truce, impose martial law, issue a sufficient number of weapons for volunteer battalions, and enable them to implement measures to eliminate terrorists,” said the statement. Putin seemed to outwit the US and the EU again. This is really like Zugzwang. President Petro Poroshenko faces very hard decisions to make in a short time. Complying with EU and Russian demands discussed during today’s telephone conversation between Petro Poroshenko, Vladimir Putin, Angela Merkel and François Hollande, where the third round of negotiations was declared with the possibility of a truce extension, could result in riots and insubordination of military units not fully controlled by Kyiv. Decisive actions could result in huge support within Ukraine, but it could result in dissatisfaction of the EU. Another option for Putin, mentioned by Stratagema Centre for political analysis director Yuriy Romanenko, is turning Ukraine into weak confederation. “This option was carefully outlined by Radoslav Sikorsky. In this case, our motherland transforms into a confederation, where the external players establish zones of their influence. Russia gets guarantees to pump gas through our territories and control over the east of Ukraine. Right-bank Ukraine is pulled into the orbit of the association with the EU. However, what is the sense in the existence of such a state? I think the driver of Ukraine’s destruction in this case would the west of Ukraine and Kyiv, which would lead to another wave of escalation in the relations between the US and Russia,” he concludes.